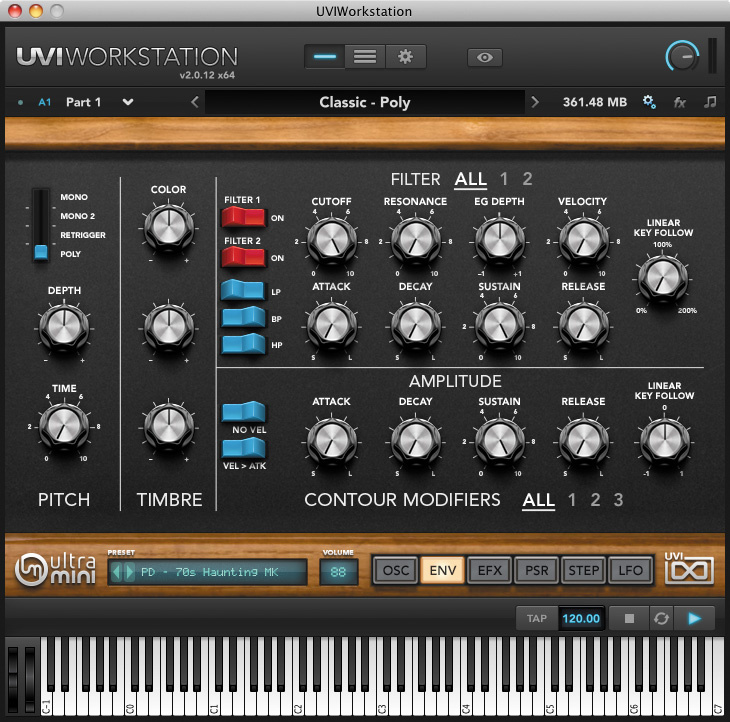 UVI's UltraMini is a software synth based on samples drawn from the classic Minimoog. It runs inside the free UVI Workstation shell, which can operate as a stand-alone application as well as a plug-in. At 1.8GB, UltraMini is a surprisingly large download. This, it transpires, is due to the very extensive sampling behind it. Doggedly recording every oscillator across every key then repeating the process for multiple overdrive settings must have a been labour of love — and this was done not for one, but for two instruments. The 1971 Minimoog Model D and a 2011 Minimoog Voyager XL are presented with identical layouts but quite different graphics, reflecting the front panel appearance of the original instruments. The raw samples are processed by two "analog modelled Xpander filters”, which have a not unpleasant response — but you wouldn't describe them as particularly Mini-like. Supplied with their own ADSR envelopes, the filters offer low-, band- and high-pass modes and are hardwired in a simple serial configuration. Being samples, the oscillators don't offer the Voyager enhancements of oscillator sync and PWM, and they have a finite workable range of transposition — as I discovered when I accidentally wandered into the nasty upper reaches of the 4' and 2' ranges. The envelopes are unmistakably digital, too: whereas an analogue envelope heads towards its target voltage from its previous level, these dispense with such subtleties and begin every journey at zero, which has an unfortunate effect on patches with a long attack and release. Despite these limitations, some Minimoog-ish tones do percolate through, but they're devoid of the subtle detuned lushness a model D, especially, is famous for. When the oscillators lock perfectly in tune, any warm, fuzzy Minimoog spells are dispersed like morning mist. Which brings up the biggest mystery of all: why use samples when modelling can do the job so much better? It's a hard decision to justify, especially since UltraMini is fairly resource-hungry, under Logic (9.1) anyway. Fortunately, I was able to reduce the worst CPU spikes by turning off the effects and using Logic's own instead. If you are able to get past the Minimoog hang-ups (which is not easy, given that the whole instrument is based on a Minimoog), though, UltraMini becomes a far more interesting synth. Some of its factory patches are jolly decent, covering a variety of polyphonic roles as well as the expected solo and bass. Extra spice is added via an arpeggiator, a dedicated LFO, a comprehensive effects section, a step modulator and a step sequencer, all of which make splendid, 'who cares if they're not Minimoog' contributions. 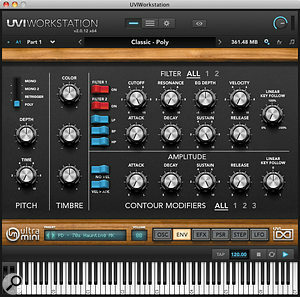 UVI Workstation facilitates the layering of several instances of UltraMini, while the instrument itself offers switchable mono or poly modes. Yet all this is delivered via a user interface that is, frankly, awkward. You are forced to deal with just one small panel at a time, making editing far less fun than it might have been. At least you can assign the many parameters for external control — but even there, reaching for a knob or slider isn't guaranteed to be pain-free. For example, adjusting the volumes of oscillators during playback resulted in ugly distortion.